One mouthy mushroom, the fancy Florida False Coral can often have more than one mouth! The Florida False Coral is a more colorful member of the mushroom clan, and has colors that will always attract attention. The Ricordea genus are some of the most sought after mushrooms due to their brilliance and the variety of colors available. They can fetch a hefty price if the color is intense. However the Florida False Coral is not nearly as pricey as its close cousin, the Knobby False Coral R. yuma. Ricordea mushrooms are usually bright or even fluorescent in intensities. The R. florida comes in several color combinations such as orange, green, yellow, blue, and purple with some having blue, purple, or orange rings surrounding a contrasting middle color. They can also have multiple mouths. A great mushroom for a nano tank, the Florida False Coral reaches a maximum of 2 - 3" (5 - 7.5 cm), and it is not a demanding coral either. It is moderate to care for and can tolerate more light than other mushrooms. However, It does not multiply as quickly or thrive under direct metal halide lighting, so indirect light would be suggested. It can handle a moderate to high water flow due to the fact that they grow so tightly against the surface they are on. They do not have a potent sting, but direct contact with another coral will still cause damage, so be sure to provide several inches of space between tank mates. The R. yuma propagates easily, yet depending on genetics, can sometimes multiply slowly in captivity. Swifter water movement may speed up propagation. Many color morphs are available from captive breeding. After splitting, the clone mushroom doesn't necessarily always resemble the "mother" mushroom, thus giving the aquarist a variety of shades and colors. They have very few predators if any. Distribution / Background Mushroom Coral Information: The Florida False Coral Ricordea florida was discovered by Duchassaing and Michelotti in 1860. 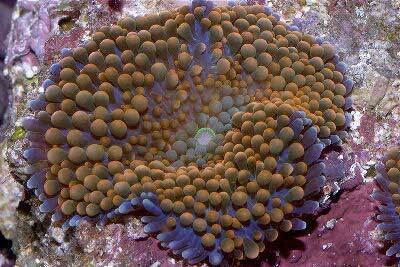 Some names they are known for are Ricordea, False Coral, Florida Corallimorpharian, Coral Anemone, and Stubby Anemone. General names both the Florida False Coral and the Knobby False Coral are known for are Mushroom Coral, Anemone Coral, Ricordea, and Mushroom Anemone. Where Mushroom Corals Are Found: The Ricordea florida are found in the Tropical Western Atlantic, in southern Florida waters and down toward Brazil. They are also found in the Caribbean and the Gulf of Mexico. Mushroom Coral Habitat: The Florida False Corals are found on rocky surfaces, rubble, or growing vertically on dead corals. They feed on small particulate in the water column and lay so flat against the surface, that they can handle the swifter water flow. R. florida propagates easily, yet depending on genetics, can sometimes multiply slowly in captivity. Many color morphs are available from captive breeding. They have very few predators if any. Description What do Mushroom Corals look like: These Coral Mushrooms Ricordea florida are basically a coral without a skeleton and their internal structures are the same as stony corals. The top of their body or the upper surface is called the oral disc. The stalk area, which is very small, is called the column and it is located just above the pedal disc, which is where they attach to surfaces. The R. florida comes comes in several color combinations such as orange, green, yellow, blue, and purple with some having blue, purple, or orange rings surrounding a contrasting middle color. They are usually bright or even fluorescent in intensities. The body, tips of the tentacles, and even the mouth can all be different colors as well. At times, the area around the mouth opening will be a muted color. The Florida False Coral can have more than one mouth opening. They tend to be more oval than round, and do not have verrucae on them. The tentacles around the margin of the mushroom can be longer which would aid in grabbing food. They can actually warp their surfaces to change the water flow over them to direct particulate material toward their mouth. Mushroom Coral Life Cycles: The Florida False Coral can grow to can grow to to 2 - 3" (5 - 7.5 cm), but their life span is unknown. Difficulty of Care Mushroom Coral Care: The Florida False Coral is moderate to care for and can tolerate more light than other mushrooms. It does not multiply as quickly or thrive under direct Metal Halides, so indirect light would be suggested. They also can handle moderate to high water flow due to the fact that they grow so tightly against the surface they are on. If their lighting and/or water movement preferences are not met, they will just float around the tank until they find a suitable spot or have an unpleasant encounter with a pump. Like other mushrooms, they can handle higher nitrates than SPS and LPS corals. Foods / Feeding Mushroom Coral Feeding: The Florida False Coral is a carnivore. In the wild, these corallimorphs are well equipped with nutritional alternatives for their well-being. They derive nutrition from their symbiotic algae, zooxanthellae, that dwells within their tissues. They also feed on small particulate in the water column, laying so flat against the surface, that they can handle the swifter water flow. They can warp their surfaces to change the water flow over them to direct particulate and flocculent material toward their mucous center for absorption. In captivity R. florida get most of their nutrition from their symbiotic algae, zooxanthellae, and tend to be a bit picky. They will eat live black worms. Other items you can try are Cyclo-peeze, newly hatched brine shrimp, and other similar sized foods. They do not feed as readily as other mushrooms. Aquarium Care Water changes of 10% bi-monthly or 20% a month are typical. Provide a reef environment with proper magnesium levels. Proper iodine levels are beneficial also. Due to their toxins, active carbon is a good idea with larger colonies of mushrooms. Do not over skim since the R. florida need nutrients to survive on and will not do well in a pristine environment. Aquarium Parameters A typical live rock/reef environment is what is needed for your Florida False Coral. Provide rubble or dead coral and live rock for them to have something with which to attach their pedal disc. If they detach, they can float around when looking for a place to settle, so it's a good rule of thumb to have all of your pumps covered. Most good quality pumps have guards on them. Marine Lighting: Moderate to high. Does not multiply or thrive under direct Metal Halides, so indirect light would be suggested. Compatibility and Social Behaviors The Florida False Coral is semi-aggressive if they are near or touching another coral. They do not have a potent sting, but direct contact with another coral will still cause damage. They will cause other corals to loose tissue, recess and/or possibly die. Acroporas will not grow in aquariums with large mushroom populations. Make sure to leave 6 - 8 " between your mushrooms and other corals. Watch the growth rate since the R. florida can overgrow and kill any nearby corals. The R. florida has been known to associate with Periclimenes commensal shrimp. Mushroom Anemones will tolerate their own species and usually other Mushrooms. In the wild many species of Mushroom Corals occur together in large groups. In captivity R. florida will get along with their own species, but may not tolerate mushroom species outside their colony. Even in one genus, if the color is different or a different species, the weaker mushroom will detach and find another location. Strong water movement will cause them to detach as well. R. florida propagates easily, yet depending on genetics, can sometimes multiply slowly in captivity. Swifter water movement may speed up propagation. Potential Problems The R. florida are disease resistant, and only affected by improper husbandry. Problems for the most Corallimorphs are pretty minimal unless your lighting, water movement, feeding and water quality are improper for these animals. A sign of this is if your coral mushroom detaches to look for "better conditions" to settle in. They have very few predators if any. Availability Mushroom Corals for Sale: The Florida False Coral R. florida can be found easily online and at pet stores, as well as from frag farmers and most reef clubs. Online they can run between $8.00 to $20.00 USD or more for a single polyp, depending on color.